Before we begin, Will Friedwald and I wish to give major thanks to bandleader and historian Vince Giordano for supplying research and rare materials to this on-going series of posts. 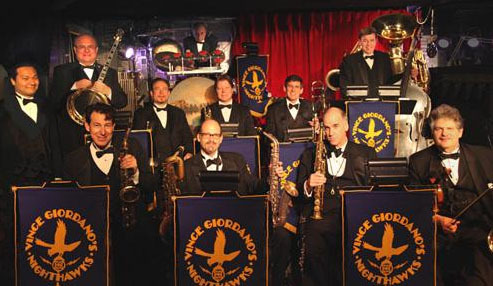 Vince and his eleven-piece orchestra, the Nighthawks, are opening this Monday and Tuesday, September 9 and 10, at what will be a new twice-weekly run at the Iguana Restaurant (240 W 54th St, New York, 212 765-5454). In addition to playing the best known pop and jazz composers of the 1920s and 1930s, like Irving Berlin and Duke Ellington, The Nighthawks have a predilection for those uncaterorizable musicians who made the cartoons and two-reel comedies of the era so special, like Raymond Scott, Leroy Shields, Carl Stalling. We highly recommend you attend. In 1934, that phrase became the title of a play by Kaufman and Hart, one of their few that wasn’t an overwhelming success. But even though Merrily We Roll Along only ran for 155 performances on Broadway, it was remembered by a few and re-surfaced in a very different form five decades later. One thing that the animated film business and had in common with the music-publishing industry in the 1930s is that they both were bottom-feeders: any idea or trend in the air or the zeitgeist would show up in a cartoon and, likely enough, also be the subject of a song. 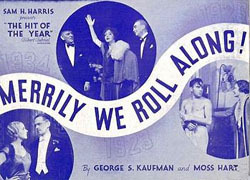 In 1935, a song was published titled “Merrily We Roll Along.” It had no direct connection to the play, but that was the whole point: after the novel Gone With the Wind was a huge hit, Tin Pan Alley came out with a song called “Gone with the Wind.” Not long after F. Scott Fitzgerald released his magnum opus Tender Is the Night, some other publishers came forth with a song, not coincidentally, also titled “Tender is the Night.” Were Margaret Mitchell and Fitzgerald invited to share in the royalties to these songs as a consideration for having inspired the title? Not bloody likely. So too it was, probably with the 1934 play Merrily We Roll Along and the 1935 song “Merrily We Roll Along.” There is no relationship of the first to the second except that the song probably wouldn’t have been written had not the play made it to Broadway. 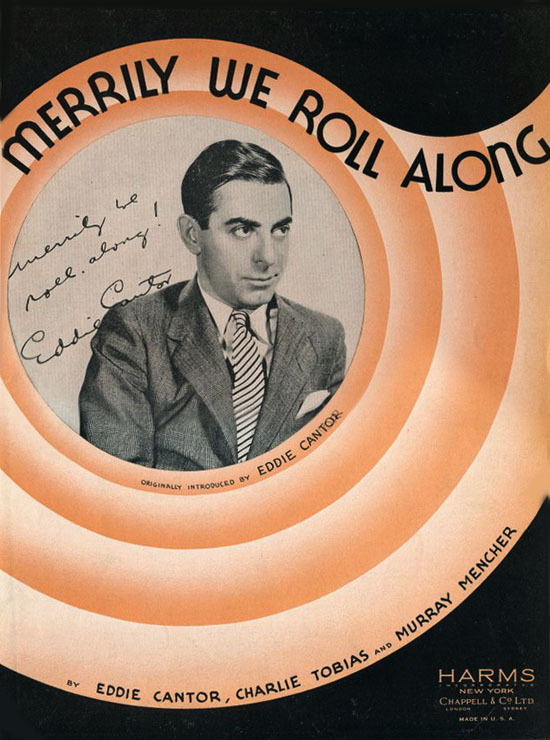 What makes “Merrily We Roll Along” especially interesting is that it was co-composed by Eddie Cantor, one of the major Broadway headliners of the 1920s, a radio star in the 1930s and ’40s, and a giant in the early days of talking picture movie musicals. (In retrospect, it also seems that Cantor was an even greater humanitarian than he was an entertainer.) It would be a stretch to describe Cantor as a singer-songwriter, in the sense that the term existed from the 1960s onwards, but he was like many of his colleagues of the era, including Al Jolson and Rudy Vallee, an interested party who had his hand in several notable songs. As it happened, Cantor had married into one of the major songwriting families: the three brothers of his beloved wife Ida, and the uncles of his famous five daughters, were the Tobias brothers, Harry, Charles, and Henry. From WWI to Vietnam, the Tobiases (working with each other as well as other collaborators) were responsible for many a and a jazz and pop standard: “Comes Love,” “Get Out and Get Under the Moon,” “It Seems Like Old Times,” “It’s a Lonesome Old Town,” “Sweet and Lovely,” “Those Lazy Hazy Crazy Days of Summer.” The third collaborator, Murray Mencher, had a catalog that included “I Want a Little Girl,” a longtime favorite of swing-era singing musicians. 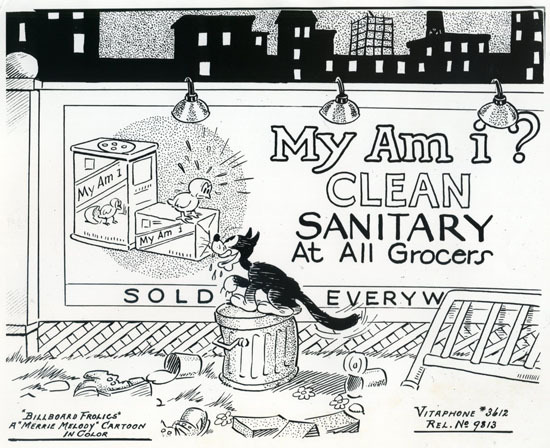 The song was introduced on screen in the 1935 Merrie Melodie Cartoon Billboard Frolics (d. Friz Freleng), and used again by director Freleng for another Cantor cameo in Toytown Hall (1936). It’s fate was sealed when musical director Carl Stalling then selected song as the instrumental opening for the entire Merrie Melodies cartoon series – starting with the first MM of the 1936-37 season, Boulevardier Of The Bronx, released in October – a role which it continued to occupy for well over 30 years. A few years before his death in 1964, Cantor was asked if any of his songs were particularly meaningful to him, and he said something to the effect that he still remembered “Merrily We Roll Along” because it became theme music “for those cute cartoons.” (The previous Merrie Melodies theme had been “I Think You’re Ducky,” coauthored by Charles Tobias, which is not entirely a coincidence since Stalling was drawing from the same finite pool of songwriters.). And Stephen Sondheim? In 1981, he and his own longtime collaborator George Furth (perhaps best known to Cartoon Researchers as a one-time “heavy” on The Monkees) transformed the 1934 Kaufman-Hart play into one of the all-time masterpieces of the musical theater, Merrily We Roll Along. Ironically, this production too was not considered a financial success on Broadway when it opened, but over the last 30 years has been increasingly recognized as a classic. Mr. Sondheim did not make use of the Cantor–Tobias–Mencher song “Merrily We Roll Along” but rather wrote his own. 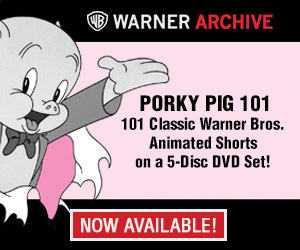 And no, the show did not feature Porky Pig – or even Grover Groundhog. Below, a clip of the first two minutes from Billboard Frolics (1935) – the cartoon that introduced Merrily We Roll Along to animation; followed by two rarely seen pieces of publicity art for the short. I noted that the cover of the sheet music features the same concentric orange circles that for decades have introduced the cartoons. Does anyone know if this was intentional on Carl Stallings’ part? Stalling’s penchant for tying in cartoon background music to song titles obviously was a major factor here — for a series already dubbled “Merrie Melodies” having a song under license called “Merrily We Roll Along” was just too easy a connection to pass up. The interesting thing is what happened with the Looney Tunes title theme. Carl almost immediately changed the opening themes to both series when he arrived at Warners. But where his new opening music for the color shorts would stick forever (except for that one unfortunate period with William Lava and the ‘new look’ MM titles), Stalling’s pick for the new Looney Tunes theme lasted only about a year, before being replaced by “The Merrie Go Round Broke Down”, which has no obvious connection to the series’ title but apparently was a song Stalling fell in love with, using it in a number of cartoons (beginning, I believe, with “Sweet Sioux”). In that latter version, “Merrily we roll along” is a well known nursery rhyme to the same tune as the US version of “Mary had a little lamb”. It seems to me that it’s being quoted in the Tobias / Mencher / Cantor song. Anyone know what year the opening sliding guitar sound was added – and by whom? Carl Stalling added the guitar slide at the beginning of the piece in 1937. It also appears within the intro as a sort of goofy accent. 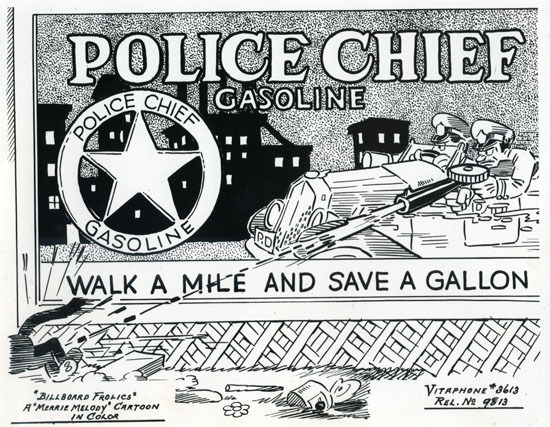 I have a radio transcription of a World War II variety program, the purpose of which was to urge the public to buy war bonds. During the show Cantor and Dinah Shore sing “Merrily We Roll Along,” with new lyrics, pushing bonds and making plentiful references to the war and to the Nazis and the Japanese. Its over in my “to be transferred” pile. May get through that someday. The video is blocked by Warner Bros.
It’s not blocked on my browser. Anyone else having a problem seeing the videos? I can see the 1940 Technicolor opening, but not the Billboard Frolics video. Bummer. I still see it on my Safari browser on my Mac… I’ll try to figure another solution to make the post complete. I have a Safari browser and it is blocked for me also. It’s blocked on Chrome running under Win7, but IE9 is running it as I type. I changed the embed above to just be the first two minutes of BILLBOARD FROLICS. That may or may not work. Great post! I’d wondered just how involved Cantor was with the song-never thought I’d hear him sing it! Okeh, you’ve got your next assignment. . . find the lyrics to “I Think You’re Ducky”. Hmmmm, which theme is “I Think You’re Ducky”? Is that the theme that opens cartoons like “BUDDY’S DAY OUT”? On that topic, here’s something. I wrote a Toy Story-style short story depicting the characters from movies and TV shows coming to life each night in a video store (like in Night at the Museum or any of the Merrie Melodies depicting inanimate objects coming alive). Upon learning that some of the characters have gotten taken hostage, they band together and come to the rescue. The story ends like Who Framed Roger Rabbit: the characters sing that song and then Porky Pig introduces the end (along with “Weird Al” Yankovic, Betty White and the Cryptkeeper). As you can see, I have no life. MY FAMILY,AS GRANDFATHER WROTE ,THATS ALL FOLKS ,IN 1937. Where does The Merry Go Round Broke down fit into this, historically? Because I spent the first few years of my life watching Looney Tunes and Merrie Melodies, “Merrily We Roll Along” was the only song that I wanted to hear (not knowing the title, I called it Warner Bros., having been able to read the words in the concentric circles). Seriously, I couldn’t stand any of the songs that the people at preschool played for us. On top of this, thanks to “The Bugs Bunny/Road Runner Movie”, the people who made the Looney Tunes were the only famous people whom I could identify for the first few years of my life, and so Mel Blanc was the first famous person whose death I heard about.